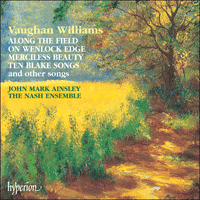 Star tenor John Mark Ainsley joins The Nash Ensemble in a programme of the principal instrumentally-accompanied songs of Vaughan Williams: the Ten Blake Songs with solo oboe, the three Chaucer settings called Merciless Beauty for 2 violins and cello, the eight Housman settings known as Along the Field, and of course On Wenlock Edge (also Housman) with piano and string quartet. There are also two folksong settings for voice and violin, The Lawyer and Searching for lambs. This recording joins John Mark's distinguished and growing Hyperion discography of English song after CDs devoted to Britten, Howells, Ireland, Quilter, Warlock and William Lloyd Webber. Though rightly regarded as one of the twentieth century’s great symphonists, Ralph Vaughan Williams responded to the setting of words throughout his long life. Songs were therefore as significant among his earliest efforts as they were in his final creative period. On Wenlock Edge was composed in 1909 and first performed by Gervase Elwes (tenor) and the Schwiller Quartet, with Frederick Kiddle (piano), in the Aeolian Hall in London’s Bond Street, on 19 November. It signalled what the ‘Sea Symphony’ and the ‘Tallis Fantasia’ would confirm in the following year, that a major composer had arrived on the British musical scene. It had been an arduous journey, however. Vaughan Williams was nearly forty and had served a long apprenticeship: two years at the Royal College of Music studying composition with Parry, three years for a Bachelor of Music degree at Cambridge University, two more years at the Royal College (this time under Stanford), a few months in Germany under the guidance of Max Bruch, and finally, in 1908, three months in Paris to acquire ‘a little French polish’ from Ravel. To which one might add the self-education that came about through his investigations into English folksong (he collected his first example on 4 December 1904) and the years of intensive research that went into preparing the great English Hymnal for publication in 1906. Such were the labours that transformed him from a composer in the German mould into a voice that could only be English. Something of this process can be felt in On Wenlock Edge. In it, the discipline of German symphonic thought is tempered by the subtlety of French impressionism and invigorated by the melodic directness of English folksong. The result is the unique language of Vaughan Williams and a turning point in the history of British music. A E Housman’s A Shropshire Lad poems were published in March 1896. Though not the first composer to recognise their suitability for music (that distinction belongs to Sir Arthur Somervell), Vaughan Williams’s cycle was the first fully integrated interpretation to appear (George Butterworth’s cycles belong to 1911 and 1912). In all essentials, Vaughan Williams’s conception is symphonic—though more a matter of emotional sweep than thematic development. Where appropriate, he treats the song as drama. Thus the conversation between the living and the dead in ‘Is my team ploughing?’ becomes a miniature opera, while the bell-like accompaniment of ‘Bredon Hill’ provides a background symphony of great dramatic intensity. Similarly, the flaring strings that accompany ‘On Wenlock Edge’ depict not only the storms that trouble the woods, but also the emotional gales that move the protagonist. And who but Vaughan Williams could have conjured up the mood of spiritual resignation and fulfilment that brings the cycle to its noble end? By any standards, On Wenlock Edge is a remarkable achievement. 1913 saw Vaughan Williams’s settings of the Two English Folksongs ‘Searching for lambs’ and ‘The Lawyer’—the latter having just appeared in Butterworth’s collection of Folksongs from Sussex. Both are in the key of A modal minor, and both are examples of the supreme sensitivity Vaughan Williams always showed when providing an effective setting for the folksongs he loved. The beneficent influence of folksong can be felt again in Merciless Beauty, settings of three rondels by Geoffrey Chaucer. Composed in 1921, they were first performed by Steuart Wilson (tenor) at a recital in the Aeolian Hall on 4 October that year. Vaughan Williams turned again to Housman for the cycle Along the Field, this time relying simply on a vocal line and a solo violin. Despite these apparent limitations (or maybe because of them) he achieves a miracle of expressiveness—the violin accompaniment ranging from the rhapsodic embellishments of ‘We’ll to the woods no more’ to the pedal drone of ‘Along the field’, and from the ghostly double-stopping of ‘The sigh that heaves the grasses’ (played ‘near the bridge’ to wonderfully hollow effect) to the perky Jig in ‘Fancy’s Knell’ that paints a lively picture of Shropshire lads dancing with their sweethearts. The soprano Joan Elwes, accompanied by Marie Wilson (for whom Vaughan Williams had already written The Lark Ascending) gave the first performance on 24 October 1927 at the Grotrian Hall in Wigmore Street. The Ten Blake Songs were composed over the Christmas period 1957/58 for the film The Vision of William Blake, produced and directed by Guy Brenton for the Bi-Centenary Committee of the Blake Society. Only eight were used in the film (numbers 2 and 3 were omitted) which also used extracts from Job, Vaughan Williams’s 1939 ‘Masque for Dancing’ based on Blake’s remarkable illustrations. The cycle was first heard over the air in a BBC recital by Wilfred Brown (tenor) and Janet Craxton (oboe) on 8 October 1958. The first public performance took place at a McNaughten Concert on 14 November, and the film itself was premiered in London on 10 October. Vaughan Williams never heard any of these performances, for he had died on 26 August, well into his eighty-sixth year. In these marvellous songs of his old age, the vocal line ranges from the extreme simplicity of ‘Infant Joy’ to the stern declamation of ‘Cruelty’, and embraces the formal tune of ‘The Lamb’ (a poem which Vaughan Williams once declared he hated!) as readily as the strophic variations of ‘The Divine Image’. Though the voice and oboe never get in each other’s way, three of the songs dispense with the oboe altogether. In the remainder it acts sometimes in an illustrative capacity (as in ‘The Piper’), but more often as a discreet support that provides a magical pivot for the implied harmonies as they change in deference to the poet’s words. Composed nearly fifty years after On Wenlock Edge, Vaughan Williams’s Blake settings are a moving swansong to the achievements of a remarkable creative life.